Lots in Store for September … Teaser: Could the NYC Parks Department be hiding something? Back Tuesday, 9/2. There’s lots in store for September! *Savvy readers are asking: just one thing? The Villager at last reports on the July 17th Washington Square Park Task Force meeting (while omitting the date of the meeting, I gather, to not to call attention to the late reporting?). WSP Blog covered this, beginning last month, in a series (in 8 parts): Update on New York City’s Redesign of Washington Square Park. If you missed it, begin here. 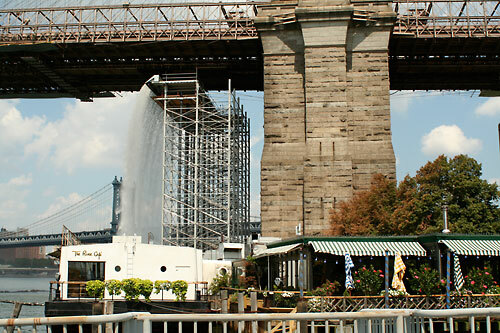 The Brooklyn Paper reports on the “NYC Waterfalls,” the Public Art project by Olafur Eliasson installed in four NYC river locations, which has become “arborcidal” (tree-killing) in Brooklyn Heights. The Brooklyn Paper is always a bit over the top and yet it captures the essence of the situation. Arborcidal waterfalls…? Perfect. (The Villager has great reporting and articles but it’s, um, pret-ty serious. In Brooklyn, the weeklies have a bit of fun with it all. It’s also effective.) The problem is that the salt water from this nearby “public art” project is spraying its mist on the surrounding trees and causing them to decline. Residents and business owners are trying to get the project to end early – by Labor Day. Sponsors The Public Art Fund turned to the NYC Parks Department for a solution (a “solution” which seems akin to the Parks Department watering the artificial turf to keep it from reaching scorching temperatures – at times, it can get twice as hot as regular grass – at 165 degrees instead of reconsidering the actual use of it). “Every morning, arborists from the Parks Department now rinse the trees and leaves along the Promenade and in the River Café’s garden with fresh water and flush salt from the soil,” the paper reports. So… What do you think? What will win out? Saving trees or boosting (allegedly) the economy? Currently, the project is set to run until October 13th. The New York Public Library exhibit “Eminent Domain: Contemporary Photography and the City – Shifting views of public and private space” ends Friday, August 29th. 42nd Street and 5th Avenue (near Bryant Park!). There is an exhibition and photography from five New York-based artists which take on the “theme of the modern city” and the “changing nature of space in New York City today.” I’m hoping to see this before it closes. At the Humanities and Social Sciences Library, in the D. Samuel and Jeane H. Gottesman Exhibition Hall, 1st floor. Free. Last summer, public outcry forced New York City officials to reconsider regulations that might have required even the most casual of tourist-photographers to obtain a permit and $1 million in liability insurance to photograph or film in the streets of the city. A majority of the objectors felt that the proposed regulations threatened First Amendment rights to photograph in public places and amounted to a kind of privatization of public space. Similarly, people have questioned the current private/public arrangements that characterize much of modern urban redevelopment, from the proposed Columbia University expansion to Hudson Yards in Manhattan, and from Willets Point in Queens to the Atlantic Yards and Coney Island in Brooklyn. Contention particularly surrounds the legal power of eminent domain, or the taking of private property for public use: at the core of the debate is the definition of “public use” and concern that the word “public” has become a euphemism to disguise what are essentially private investments. … [the] photography poses questions that resonate with current debates about the reorganized urban landscape and the consequent shifting of public and private space, whether through gentrification, globalization, or the suburbanization of the city. Politics as Puppetry Blog has the whole Disorientation Guide to NYU available for download. It contains material on Activism at NYU, a Flow Chart to How NYU Works, Taking Back NYU, Who the Trustees are, and more! Washington Square Park is world famous for the art, culture, music, politics, and community that has transpired there in its over 150 years as a public park in New York City. For NYC government under Mayor Bloomberg, its importance has become magnified because of its location in the midst of prime real estate in Manhattan’s Greenwich Village. New York University owns much of (close to all) the real estate that surrounds the Park. The University rarely misses an opportunity to feature the historic Washington Square Arch in its advertising and promotional materials. 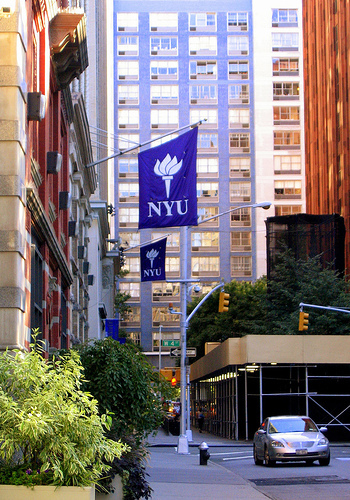 The Park is the setting of NYU’s graduation ceremony. The New York City Parks Department is presently in the midst of a redesign of Washington Square Park. Currently in Phase I (of three phases), this “renovation” is really a complete overhaul of this historic, beloved space. The redesign will: align the Fountain with the Arch (after 137 years unaligned) at Fifth Avenue which entails moving the Fountain 23 feet east, level the unique ‘sunken plaza’ around the Fountain, reduce dramatically the public gathering space around the fountain, add more lawn, reduce the width of the pathways and areas at the corners of the Park, move the two dog runs, lose the small alcoves (sitting areas) on the northern and eastern sides of the Park, and basically move close to every piece of the Park into a different location. 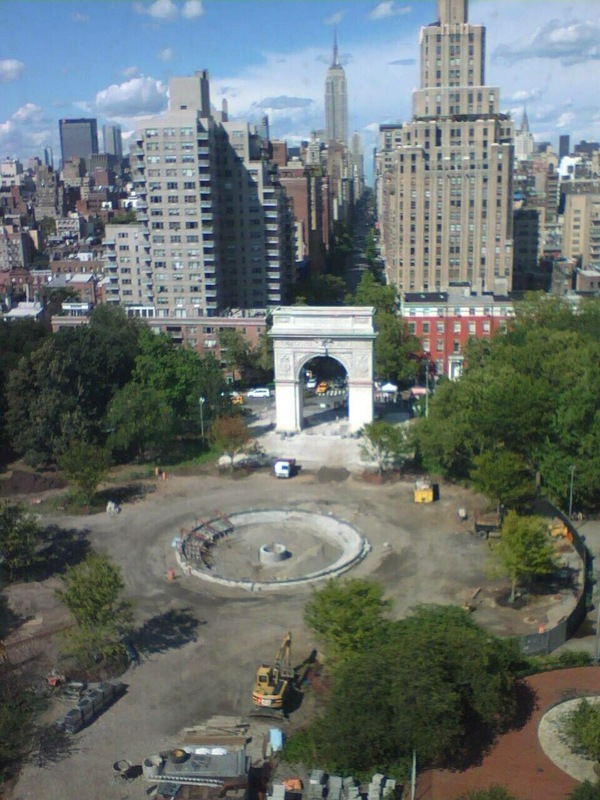 Bloomberg’s Privatization of Washington Sq Park: NYU, Tisch, Who Else? Phase I of the City’s extensive planned “renovation” of Washington Square Park has gone from a projected $6 million to over $13 million. The “renovation’s” TOTAL costs — in two Phases (WSP Blog Note: now three) — were stated to be $16 million at the onset (an excessive sum to begin with) but are now lurching upwards to $25-30 million. Today’s New York Times has the story. Have I mentioned that I consider this a bad idea? Some of the elements of the redesign of Washington Square Park have been championed by redesigner George Vellonakis as being necessary in order to get the park up to code under the Americans with Disabilities Act(ADA). This came up at the Washington Square Park Task Force meeting, specifically in relation to The Fountain, the Bathrooms, and the new Elevated Concert Space. Although it might seem to affect only one part of the community, once you dig a bit deeper, the changes – or reasons given for the changes – affect everyone. One of the most important elements that people with disabilities asked for at Washington Square Park was renovation of the bathrooms which are currently not accessible to the disabled. In fact, virtually everyone who utilizes the Park felt the bathrooms and the cracked pathways were most in need of immediate repair. Yet, as discussed in Part III of the WSP Blog’s series, the bathrooms are not being renovated in Phase I, or Phase II, but in Phase III (sometime in 2009). George Vellonakis stated that the fountain area had to be changed to a level surface (from its “sunken” surfacing) to make it compliant to ADA and therefore accessible for people with disabilities. Margie Rubin, from NY-based group Disabled in Action and a Village resident, counters this. I spoke with her the other day to clarify some statements she made at the WSPTF meeting. As far as filling in the “sunken” area of the fountain – a favored aspect of Washington Square Park because of its charm and enhancement of the sound for performances – she says, “No one in the [disabled] community wanted that. … People were perfectly happy with a ramp [being put in] – except for George Vellonakis.” Apparently, the ramp interfered with Vellonakis’s design aesthetic. Instead of retaining a unique and well-liked aspect of the Fountain area, Vellonakis was given the leeway to proceed with his own vision for Washington Square Park over countless numbers of the Park’s users. In Part II of the series, I addressed the problems with the diminished height of the Elevated Concert Stage which is in Phase II of the design plans. The stage is currently 36″ high which works quite well. The new plans make the stage an astonishingly low 22″ with no railing. This area will be utilized by the Washington Square Music Festival and other performances, protests, and overall community use. The reason Rubin believes that the stage is not the necessary height is because, at the higher height, Vellonakis would need to change his design to accommodate ADA regulations. ADA stipulates that, for every 1″ high, the ramps needs to be 12″ long. Once it reaches 30 feet, there needs to be a (5 foot) platform/resting area. Let’s hope that reason – and functionality – prevail on this one. … And, if you take a look at the NorthWest Quadrant in Phase I of the Redesign of Washington Square Park, presently being completed, you’ll see exactly what that means. Here are the final parts of Washington Square Park Blog‘s series Update on NYC’s Redesign of Washington Square Park. This has been focusing on information on the redesign work thus far and what’s in store. I’ll post Part VIII next (yes, there are now eight parts!). There will be a small and large dog run, both located along Washington Square South, relocated from their previous locations within the park. One or both (note: I need to clarify this) of the dog runs will be open 24 hours with a sidewalk entrance which will be open at all times (extended hours from midnight to 6 a.m.). Small dog run will be located on Washington Square South between LaGuardia Place and Thompson Street. It will be 2 x as large as the previous small dog run. Large dog run will remain the same size and will be located on Washington Square South between Sullivan and Thompson Street. The dog run locations and their proximity to the street increases the chance of a dog getting out of the dog run, entering the street and being hit by a car. There also is not as much shade in these locations. Suggestions from the Community at the Meeting: Increasing the size of the large dog run by possibly reducing some of the grassy area and expanding the dog run into it. Someone mentioned that people watch the dogs and since a prime spot in the new location to view the dog run will be the sidewalk, this will increase traffic along an already heavily trafficked route. It was also mentioned that the WSP dog runs are really only one of two possible off-leash locations south of 57th Street. Previously, East River Park was an option but that got artificial turf-ed and Christopher Street Pier is “no longer” (I assume because it got prettified and absorbed into Hudson River Park). To start at the beginning with Part I, see Key Posts (on sidebar at right). For Part VIII and Conclusion, click here. The tragedy that is the destruction of two Bronx parks for Yankee Stadium, a corporate entity, continues to make news. It’s almost inconceivable to fathom that more than 22 acres of parkland in the Bronx and over 400 trees were destroyed for the Yankees to build a new stadium. When their last stadium was built, the team played at Shea Stadium for two seasons. But such is the political climate we live in today in Mayor Bloomberg’s New York that such a thing was not even considered and corporations were given favor over people as well as nature, our parks and public spaces. [Community residents] remember when they could just walk over to Macombs Dam Park and play for as long as they pleased. They were never interrupted in the large expanse across the street from Yankee Stadium, which included tennis courts, soccer and baseball fields and a running track. South Bronx residents lost 22 acres of parkland, in Macombs Dam and Mullaly Parks, when new Yankee Stadium construction began two years ago. In accordance with state and federal law, the Parks Department plans to replace the acreage with new recreational sites in the area. But soaring costs, construction delays and what some have described as questionable planning have caused residents to cry foul, castigating city officials and the Yankees for taking away some of the most popular parkland in the community.